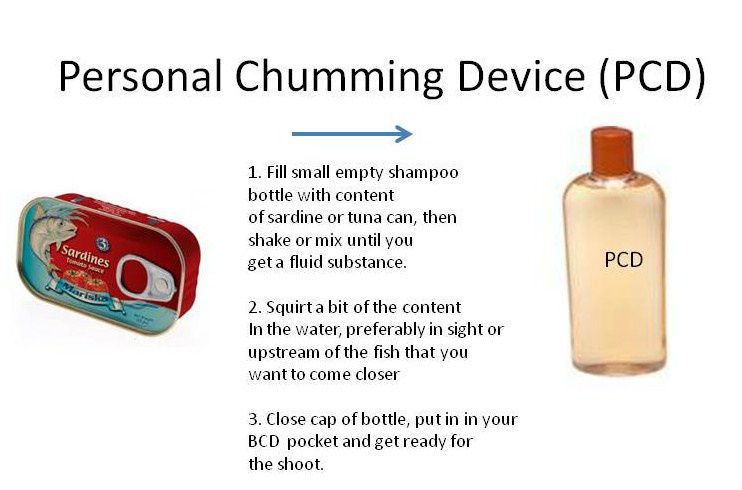 This device (I called it PCD, Personal Chummign Device) is meant to attract species of medium size such as a grouper, wrasse, a moray eel, or a shy octopus, without disturbing their natural behavior or causing too much excitement under water. The idea is to squirt some of the content of the plastic bottle in the water in the vicinity of your 'target'. Then close the bottle, put it in your BCD and wait. It you return to the same diving site (or territory) next day, the fish you met the day before will probably remember you and will approach you again after a while. Its definitely not a a bait, rather a smell stimulus or 'incentive' to attract fish.